Among the world’s foremost authorities on the study of the Blessed Virgin Mother, the Marian Library is leveraging traditional and emerging media to attract students, share expertise and invite conversation and collaboration for people to better know, love and serve Mary. 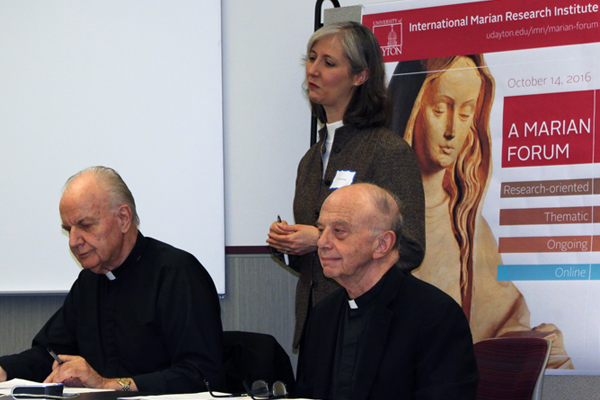 The Marian Forum, an interactive conference started in the fall of 2015, serves to illustrate. With participation both in person and online, the forum has tripled in attendance since its first session, reaching 21 states and 15 foreign countries in the fall 2016 session. The sessions include a one-hour presentation by up to three invited experts, followed by an hour of questions, answers and discussion. Following the Forum and a scholarly review of the presented papers, the International Marian Research Institute publishes the papers. “This ongoing, more frequent format allows fresh, new research and creativity in furthering the study and teaching of Mariology,” Dodd said. Read more about the forum online. A recap of the April 7, 2017 Marian Forum is on the Marian Library blog. The University Libraries have a trove of rare and one-of-a-kind books, documents, sacramentals, relics and other treasures in their special collections, ranging from baseball cards and holy cards to saintly relics and sheet music. But they’re a well-kept secret. The Libraries are working to build awareness of the collections so that students, faculty and researchers can use them in their courses and scholarly work. The University of Dayton Libraries are continuously adding to their expertise on open data and structuring library services to assist faculty and students with data management planning and archiving. Several pending grant proposals contain library-supported data management plans, and UD?s open-access institutional repository, eCommons, is one of many available outlets faculty have for storing and archiving data for future research.